People come from many different backgrounds. For many, the spiritual environment in which they were raised has a tremendous effect on their view of doctrinal tenets, religious practices, and definitions of religious terms. Such is the case with the word translated as “confession” in the New Testament. So when I say that confession is a necessary precondition for forgiveness I need to clarify some biblical concepts and terminology. So is John saying here that we must go before a priest and orally confess our sins in order to receive absolution? No, and here is why. Rather than meaning admitting what we have done, the Greek word used in 1 John 1:9 is “homologeo” which means “to say the same as”. So what is required is that we say the same thing about our sin that God says about it. Rather than being a “get it of jail free” card, this confession entails changing our minds about our sin, so repentance is included in it since the word translated repent means to change your mind. This change must be deep enough that we begin saying the same thing about our sins that the Bible says. There is nothing biblical about just admitting what we have done, or even asking God to forgive us of our sins if we have not forsaken them. It’s not about saying the magic words. We need to not only forsake our sin, but actually hate it. 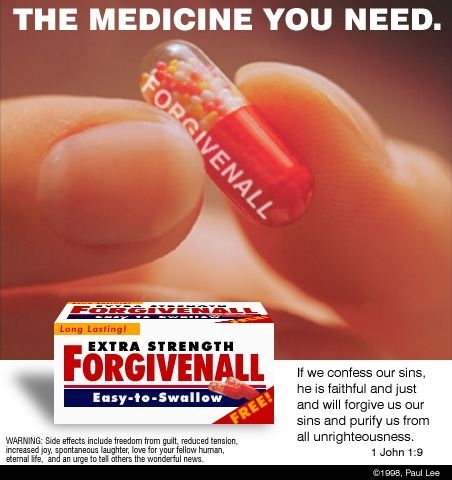 And our hatred of our sin, and the realization of our personal culpability of those sins being part of the reason Jesus was murdered, will also lead us to say what God says after we have been forgiven. When God has forgiven us, we have no authority to continue accusing ourselves before Him. To do so is to align ourselves with “the accuser of the brethren” (Revelation 12:10). Our confession is also one which encourages accountability. James said we are to “Therefore, confess your sins to one another, and pray for one another so that you may be healed. The effective prayer of a righteous man can accomplish much.” (James 5:16) Our secret sins are the ones which entangle us like the little wooden chair left out in the living room at night that finds our shin and throws us to the ground. But being open and honest about our struggles with our fellow believers helps us to overcome those habitual sin patterns so that we can walk in the light, not the darkness. but if we walk in the Light as He Himself is in the Light, we have fellowship with one another, and the blood of Jesus His Son cleanses us from all sin. (1 John 1:7). So let us hit sin with the very weapon that will cause it to shrink back — the light. King David discovered this secret thousands of years ago, and God has preserved it for us today in Psalm 32.